For a natural treatment system to function, oxygen must mix into the water. At Fernhill, freshly aerated water tumbles to Fernhill Lake through a water garden of artfully placed boulders, pine trees and graceful arched bridges. Hoichi Kurisu, international landscape architect acclaimed for creating healing gardens, designed the water features, arched bridges and garden areas for beauty and solace. To achieve the desired impact, he selected 1,500 tons of boulders from a local quarry to complement 30-year-old contorted pines that he had grown. These were precisely positioned. Two bridges, constructed of Douglas fir, complete the effect. The philosophy behind Fernhill is to provide a place for the community, where people can leave behind the urban environment and the stress of their daily lives to embrace nature and enjoy the surrounding song birds and habitat. "... it’s not just about healthy water. It’s about healthy and mindful living" - Diane Taniguchi-Dennis. To help achieve this, Clean Water Services, the Audubon Society of Portland and Bienestar Community Development Corporation have partnered through Tree for All to host Health and Nature Walks at Fernhill. 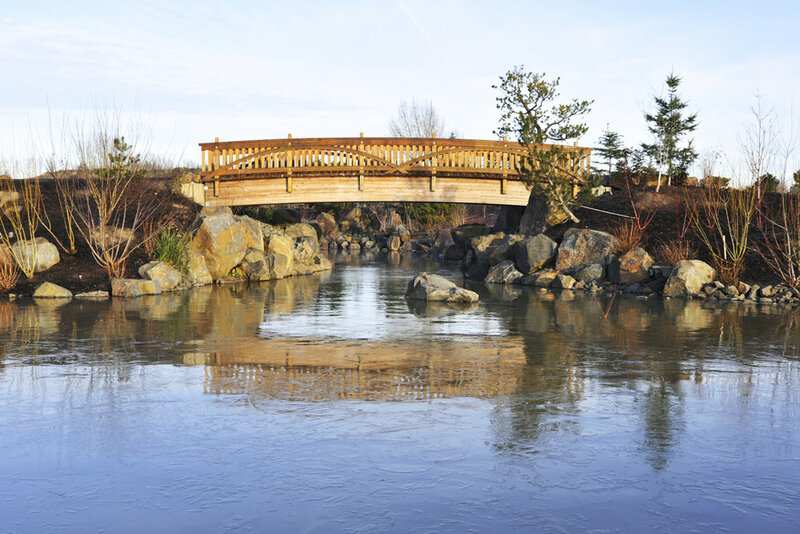 Read more about Clean Water Services' intention for the Fernhill water garden in An Oasis in the Most Unlikely Place, by Clean Water Services' Deputy General Manager, Diane Taniguchi-Dennis. Before the Water Garden, this area was a parking lot. You can see the iconic cottonwood tree in the background that now is a central feature to the Water Garden.